Oops - we don't appear to have a video for the SideKick 1400u. 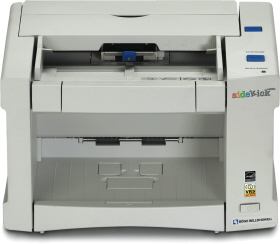 Introducing the Kodak SideKick 1400 document management scanner, a cost-effective workgroup and department duplex colour scanner bundle that contains, in a single box, everything an end user needs to connect and operate a total desktop scanning solution. Sidekick features both colour and bitonal scanning capabilities and excellent speed and image quality for an entry-level scanner. Ideal for Small Office, Distributed Scanning the Sidekick bundle provides a powerful desktop imaging solution for small offices, departments ofeducational institutions, government organisations and hospitals. Its small footprint and ease-of-use also make it ideal for distributed scanning systems, where smaller, low-volume scanners are used at multiple locations to capture documents and send th images on to larger, central processing locations.